I’ve been doing a deep dive of the discount stores lately, looking for bargains wherever they may dwell. And I’ve been finding a lot to like, too. For instance: this linen dress from Iro drapes so prettily, and looks like it would be great for a hot summer day. 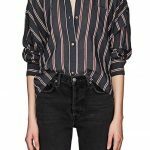 Such a pretty, feminine blouse, also from Iro. This is the kind of shrunken leather jacket that I’m always telling you guys to wear with voluminous dresses. 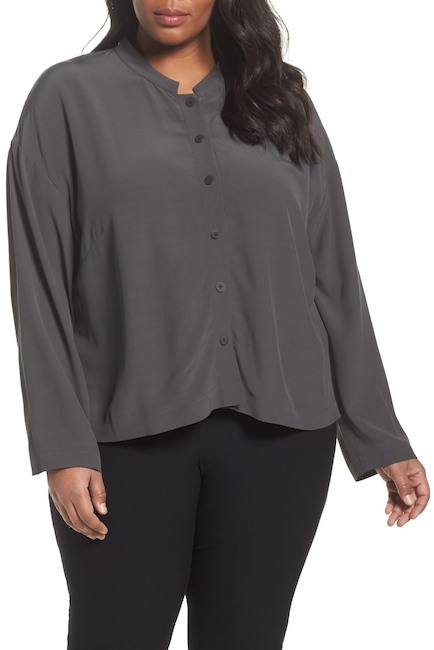 I like the mandarin collar and dark grey hue of this Eileen Fisher blouse. 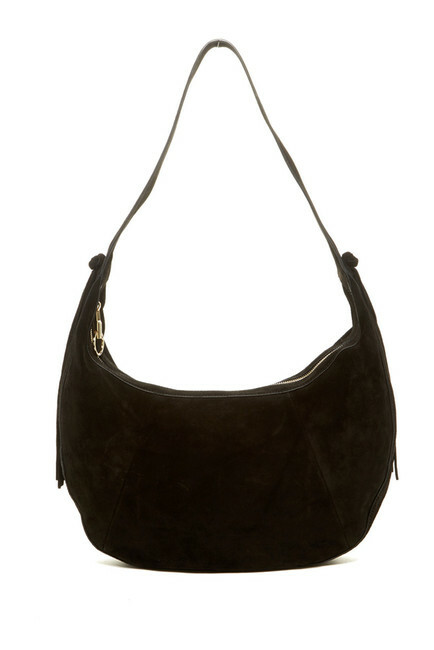 A great, slouchy hobo bag by Elizabeth and James. 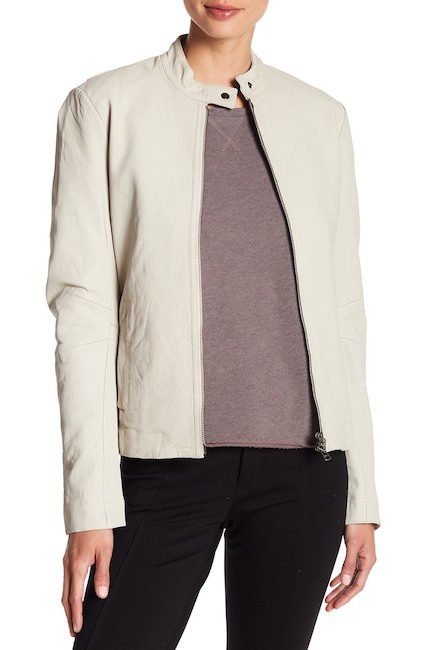 White leather jackets can be tricky, but this one works because it’s more of an ecru, and the lines are so clean. 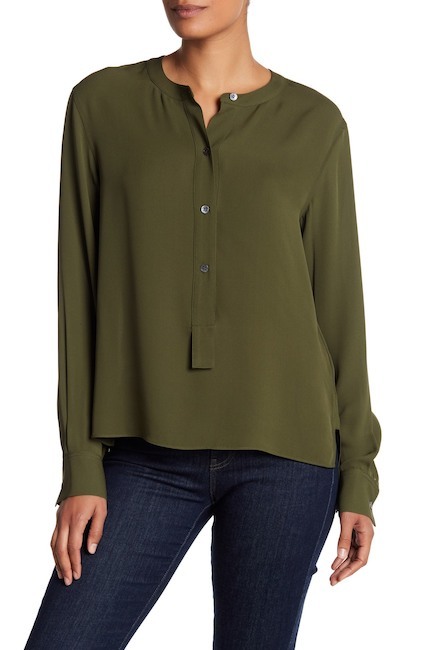 Just an easy silk blouse from Theory. 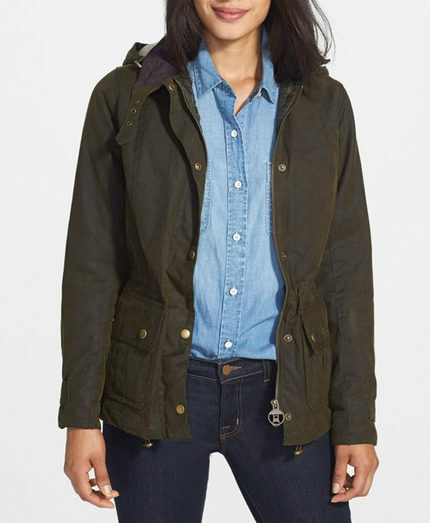 This Barbour jacket has a hood and a flatteringly cinched waist. 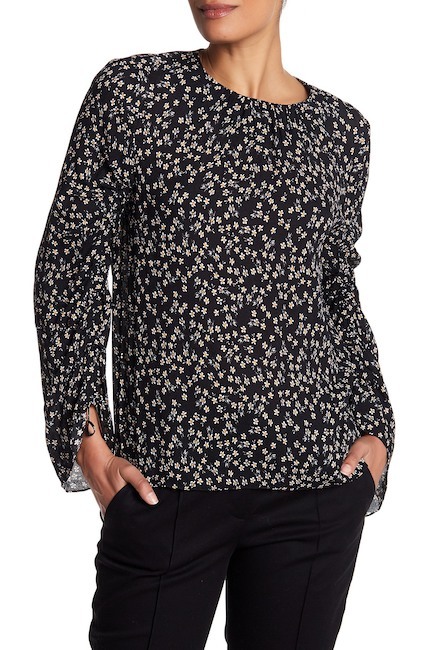 There’s a sweet yellow floral print on this Tibi blouse. A highly wearable dress from Vince. 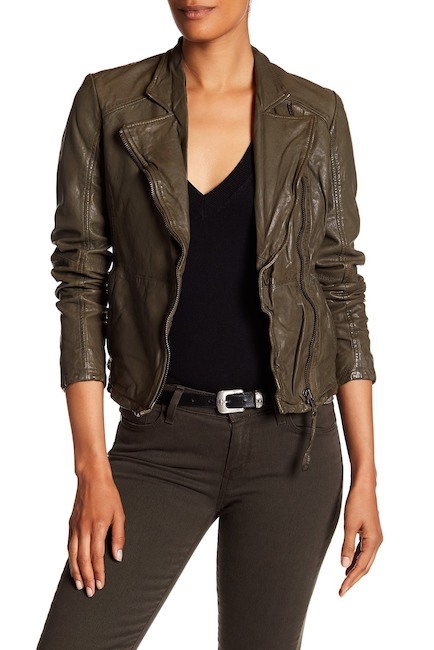 A very layer-able moto jacket. 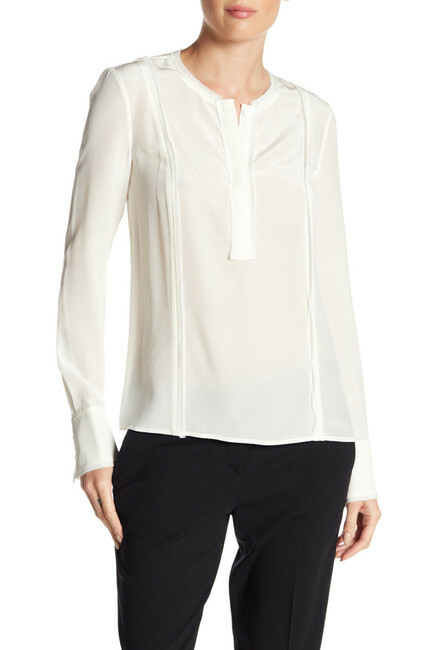 The subtle pleating on this Jason Wu blouse is quite elegant. The Rack is the best! I love that you are doing this topic! The leather jackets here are especially great. Nordstrom Rack also has fantastic shoes. I love that you are doing this topic! The leather jackets here are especially great. Nordstrom Rack also has fantastic shoes. I used to shop at the original Nordstrom Rack in downtown Seattle. It was a wild and wooly adventure! Now, I shop mainly in the shoe department and have found some sound bargains there. This is such a good selection of clothing, Kim––far better than what we have “in store” at our Austin branch! I used to shop at the original Nordstrom Rack in downtown Seattle. It was a wild and wooly adventure! Now, I shop mainly in the shoe department and have found some sound bargains there. This is such a good selection of clothing, Kim––far better than what we have "in store" at our Austin branch! 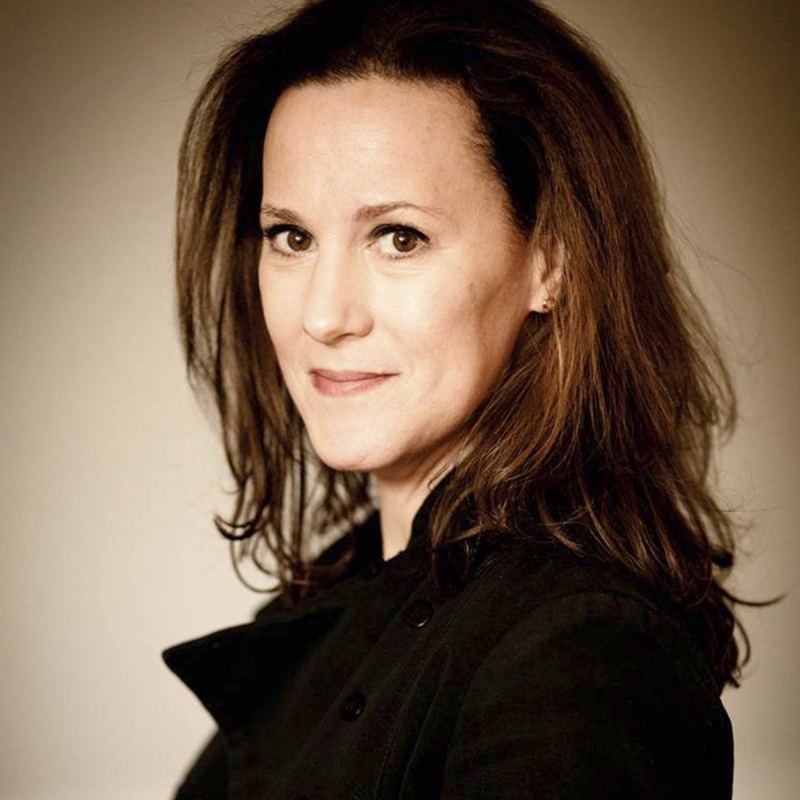 Love that you are doing this….please repeat often. Your selections are wonderful, and your guidance very helpful. Thank you! Love that you are doing this....please repeat often. Your selections are wonderful, and your guidance very helpful. Thank you! As a big discount shopper, I love that you are dong this. I have question though that I would welcome some expertise on. I have read that the clothes featured at discount stores like Nordstrom Rack and Off 5th are not the same as the once in the true department stores. That labels like Theory have a “diffusion line” where the style is the same, but the quality is not. Does anyone have any insights on this? As a big discount shopper, I love that you are dong this. I have question though that I would welcome some expertise on. I have read that the clothes featured at discount stores like Nordstrom Rack and Off 5th are not the same as the once in the true department stores. That labels like Theory have a "diffusion line" where the style is the same, but the quality is not. Does anyone have any insights on this? I know that what you’re referring to is absolutely true of most outlet stores, but I don’t think it’s the case with these stores. I know that what you're referring to is absolutely true of most outlet stores, but I don't think it's the case with these stores. Jennie, I use Nordstrom Rack and Gilt frequently to purchase discount clothes from brands that I also sometimes shop full-price, both in-store and online. I stick only to brands I already know and love. I’ve found that I have far fewer returns that way. And I can happily report that what shows up on NR and Gilt, at least for Rebecca Taylor and Iro, was definitely once in the store at full price. Same for their Vince shoes. For example, on NR right now are 2 tops and a dress that I tried on at Rebecca Taylor’s NYC West Village location and then bought on sale on the Rebecca Taylor site (they have great sales and then on special weekends have a sale on the sale). Now, with Rebecca Taylor I find one has to be choosy or you risk looking like a 45 yr old who thinks she’s going to a toddler tea party in England…dressed as a bohemian toddler. But sometimes also there are real gems in her line. Happy hunting!!! Jennie, I use Nordstrom Rack and Gilt frequently to purchase discount clothes from brands that I also sometimes shop full-price, both in-store and online. I stick only to brands I already know and love. I've found that I have far fewer returns that way. And I can happily report that what shows up on NR and Gilt, at least for Rebecca Taylor and Iro, was definitely once in the store at full price. Same for their Vince shoes. For example, on NR right now are 2 tops and a dress that I tried on at Rebecca Taylor's NYC West Village location and then bought on sale on the Rebecca Taylor site (they have great sales and then on special weekends have a sale on the sale). Now, with Rebecca Taylor I find one has to be choosy or you risk looking like a 45 yr old who thinks she's going to a toddler tea party in England...dressed as a bohemian toddler. But sometimes also there are real gems in her line. Happy hunting!!! I had to thank you Jen for such a detailed follow up. AND, I totally know what you are saying regarding Rebecca Taylor. I have found many a jacket of hers I adore but then look at the coordinating dress or skirt and think “NO!” 🙂 totally toddler at a tea party one me at 44! I had to thank you Jen for such a detailed follow up. AND, I totally know what you are saying regarding Rebecca Taylor. I have found many a jacket of hers I adore but then look at the coordinating dress or skirt and think "NO!" :-) totally toddler at a tea party one me at 44! As I understand it, that’s more for the ‘outlet stores’ you see in the big chain outlet malls (ie Tanger): J Crew, Banana, Gap, etc. Nordstrom Rack & Off 5th, as I understand it, have stuff that didn’t sell in the ‘real’ stores. I’ve actually come across stuff at NR that I paid full price for at Nordies, but like 2 years before and in a different size. @ c.w. : some Nordstrom Racks are definitely better than others! My favorite is the one on Union Square in NYC. Some of the more suburban ones seem only 1/2 a step (if that) above a Marshalls. As I understand it, that's more for the 'outlet stores' you see in the big chain outlet malls (ie Tanger): J Crew, Banana, Gap, etc. Nordstrom Rack & Off 5th, as I understand it, have stuff that didn't sell in the 'real' stores. I've actually come across stuff at NR that I paid full price for at Nordies, but like 2 years before and in a different size. @ c.w. : some Nordstrom Racks are definitely better than others! My favorite is the one on Union Square in NYC. Some of the more suburban ones seem only 1/2 a step (if that) above a Marshalls. 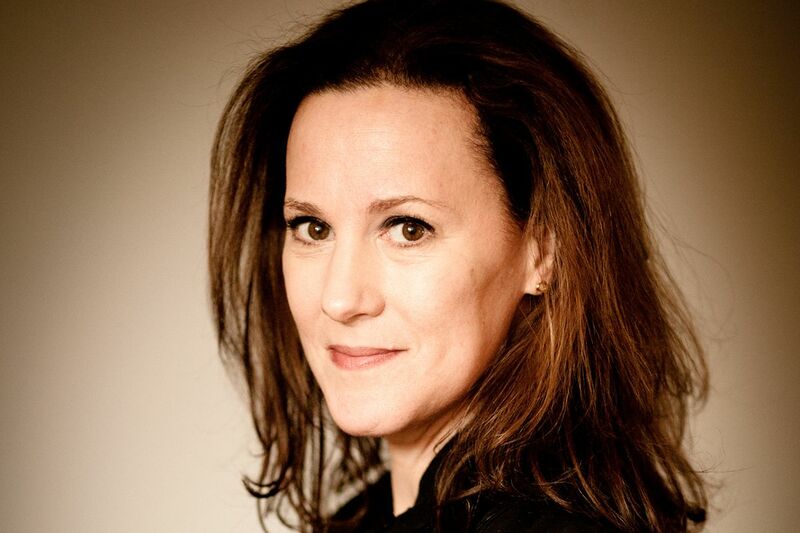 Thank for the tip on the Union Square store––Hope to check it out this summer! If I am in town, I would love to join some other GOACAs for a Nordstrom Rack trip (with snacks at Union Square Coffeeshop). The Rack is opening soon where I live, and I truly hope they do not repeat Target’s terminal error (i.e. poorly-stocked stores with merchandise that is not sold south of the border). The Rack in Seattle and Portland work for me, Please give us the real deal Nordstrom! The Rack is opening soon where I live, and I truly hope they do not repeat Target's terminal error (i.e. poorly-stocked stores with merchandise that is not sold south of the border). The Rack in Seattle and Portland work for me, Please give us the real deal Nordstrom! I LOVE Nordstrom Rack. It’s like Marshalls but with better stuff. The one nearest me has great deals on luggage, too. I LOVE Nordstrom Rack. It's like Marshalls but with better stuff. The one nearest me has great deals on luggage, too. Oh that Vince dress! Thank you for this type of post, Kim. 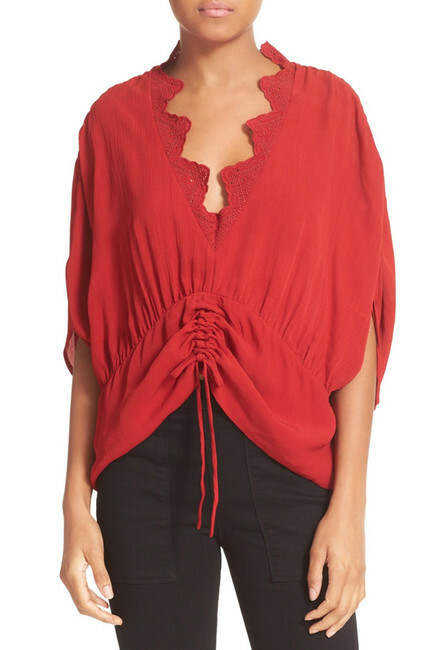 The Tibi blouse and Vince dress are idling in my shopping cart. Must keep the looming tax bill and upcoming vacation abroad at the forefront of my brain to keep me from clicking the Check Out button. 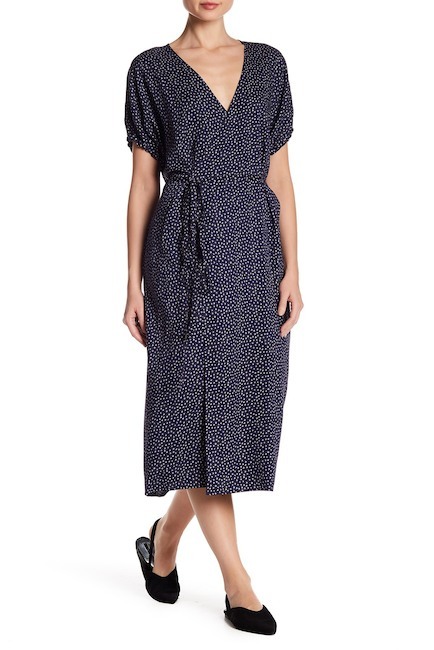 Hope I’m writing this before you click — the Vince dress is much cheaper at LastCall and Bergdorf Goodman!!! I’ve learned from annoying experience to always google before checking out on a discount site… what is on sale in one place is often on (better) sale somewhere else. Hope I'm writing this before you click -- the Vince dress is much cheaper at LastCall and Bergdorf Goodman!!! I've learned from annoying experience to always google before checking out on a discount site... what is on sale in one place is often on (better) sale somewhere else. Thanks for the heads up…bought it from BG! Thanks for the heads up...bought it from BG! You found some incredible choices at NR, Kim…but don’t give away ALL of my secrets! Dress #1 by IRO is exactly what I love, kind of architectural yet casual, simple and unique. Unfortunately, not my size. :-( You found some incredible choices at NR, Kim...but don’t give away ALL of my secrets! NR is my favorite discount store, I buy online constantly and do the drop off returns. 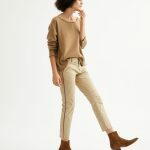 Have you seen the Runway section at TJ Maxx online? They only have it in a few select stores. Also, the stores have a much larger selection, I’m talking Celine purses, its amazing! NR is my favorite discount store, I buy online constantly and do the drop off returns. 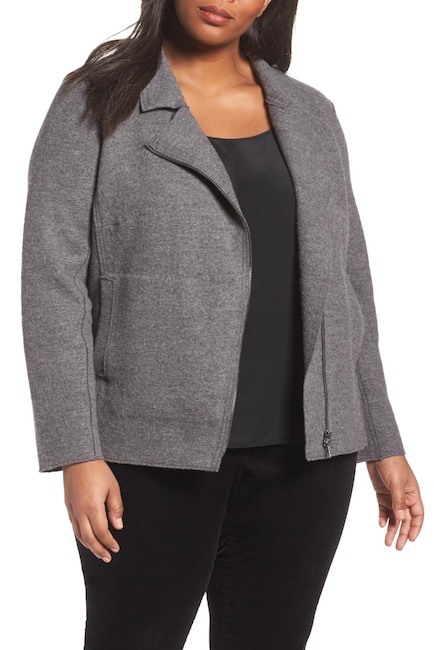 Have you seen the Runway section at TJ Maxx online? They only have it in a few select stores. Also, the stores have a much larger selection, I'm talking Celine purses, its amazing!